It's the third time in six years that Israel launches a war on Gaza. Can you imagine that? If you were a Palestinian child born in Gaza 6 years ago, you would now have lived through three wars (provided you survived all of them). It's also the third time in six years that the Israelis pull out their tried-and-trusted-'Hamas-hides-behind-the-people-and-uses-them-as-human-shields-therefor we are allowed to bomb anyone and anything,'-rhetoric, and I'm getting really, really tired of it. I previously posted the below text on facebook, but decided to share it here, too. So let's talk about those so-called 'human shields', shall we? 1) Saying Hamas uses 'human shields' (rather than, for example, 'civilian shields') implies that once you are Hamas, you are no longer human. Therefore, any Palestinian who picks up arms to fight the occupation is no longer seen as human. 2) If, as a Palestinian, you resist the occupation in other, possibly non-violent ways (and it seems that 'being physically present in Gaza' already counts as such), the very rhetoric of being used as a human shield strips you of the very thing that makes you human: agency. It means your presence is not the result of your own convictions, no, you are merely a puppet in the hands of the terrorists. And puppets, as we all know, are not human. Simple, right? Two birds, one stone; they're either violent terrorists or passive weaklings used by terrorists. Neither is human, neither deserve that we care about their life. Oh, and let's not forget that the first ones are usually men and the second usually women, meaning that as an added bonus this rhetoric reduces the resistance of Palestinian women in its many shapes and forms to zero. Ugh. I think "Do I know any Davids in Gaza?" 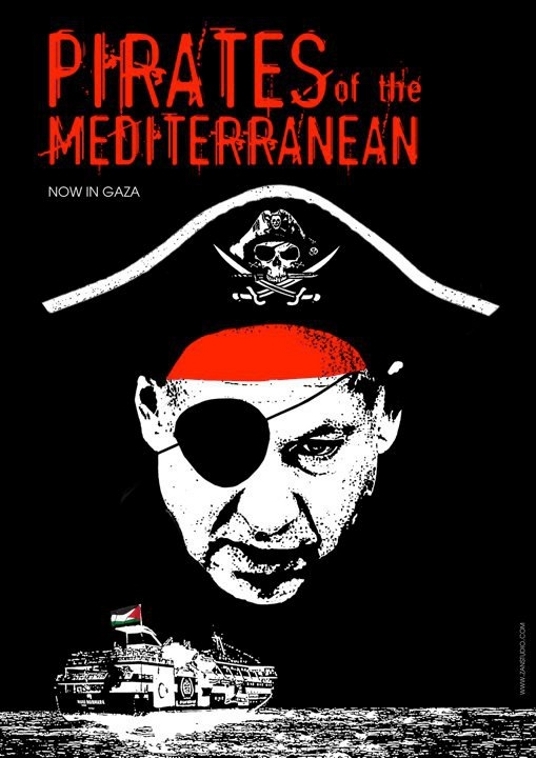 From The Magnes Zionist, ‘The Attack on the Free Gaza Flotilla’. Dear Europe, Sorry about the ash clouds over your head and that you can’t travel anywhere. We understand exactly how you feel. Source: Facebook status update, author unknown, that is now spreading like wildfire. When a video against Israeli propaganda and advocating Palestinian resistance has (google) ads at the end for 'Israeli Law' (Litigation, Commercial, Diplomatic Serving Governments and Businesses), and for 'Israel private tour guides', for customized tours to discover Israel’s secret addresses and tips. Yes, I believe that’s what we call ironic.